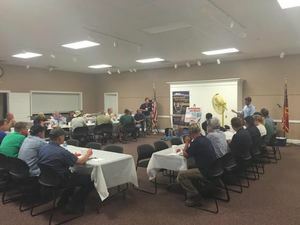 The Stephens County Development Authority and the Toccoa-Stephens County Chamber of Commerce hosted representation from 10 local companies and industries at our quarterly plant managers meeting. This quarter’s meeting was hosted in conjunction with our local City Electric Supply store. The speaker CES lined up from MeltricCorporation focused on arc flash protection, lock out/tag out,PPE, safety barriers and hazardous locations. He brought along several products that meet OSHA’s standards.